Do you ever feel like there aren’t enough hours in the day? It’s probably because there aren’t. Between taking care of the family, work, and everything else you need to get done during the day, you can easily feel overstretched and quite frankly, exhausted. However, the problem with being so busy is that it can be difficult to know when to stop. Do you need a break? Perhaps you should take a look at some of the warning signs. Being run down can lead to a constant state of feeling sick. From not being able to shift a cold to dealing with those aches and pains, being constantly sick with something or other is your body’s way of telling you that you need to slow down. When you’re busy looking after other people, your own health can suffer, so it’s important to take a break to help you recharge. Take your vitamins and eat plenty of fresh fruit and vegetables to give your body the help it needs to stay healthy. When you’re stressed or anxious, it’ll show in your sleeping habits. Sleep is so important for our bodies and minds, and if you’re not getting enough of it, you’ll lose your focus and show irritable behavior. As difficult as it can be to adopt a sensible bedtime, try to stick to it and remedy what’s causing your broken sleep. There’s a lot you can do to enjoy a more restful night’s sleep, so make it a priority to get some quality rest. As a parent, a friend and an employee, there’s a lot of pressure put on you to perform. But the pressure to get things done can soon take its toll, leaving you unable to fully function. If this is familiar, it sounds like you need a vacation. Some physical distance between you and your environment will do you the world of good to feel refreshed, and can give you the headspace you need to think clearly. Taken a vacation is easier said than done when you’ve got relatives to care for, but respite care could be a solution – even if only for a day or two. Taking the time to truly switch off from all of your chores and responsibilities will give you the clarity you need and help you de-stress. Being constantly busy often means you eat on the go, and eating on the go rarely means healthy! The ‘grab and go’ behavior might help stop the hunger pangs, but it could lead to weight gain, a lack of energy as well as increasing your risk of several diseases. Try to change your habits – a healthy lifestyle will change your life for the better, and a large part of that comes from eating a balanced diet. 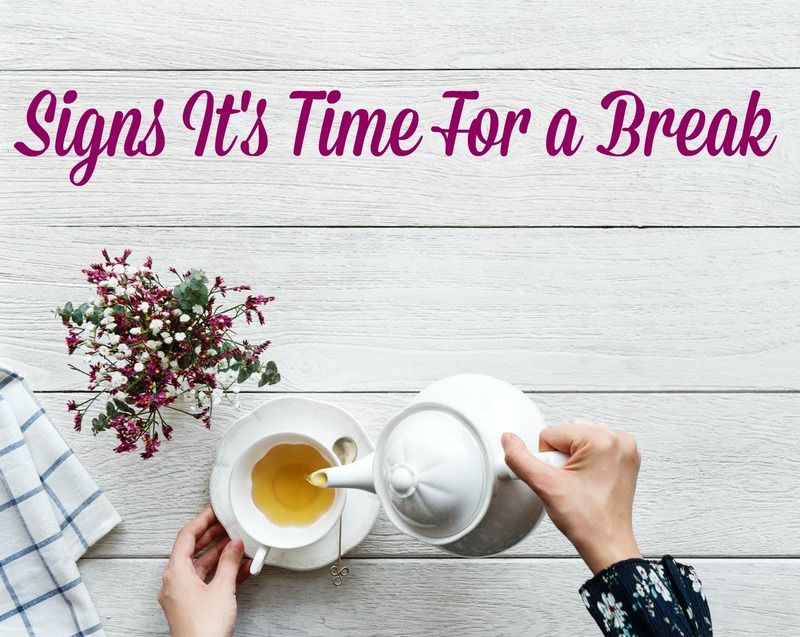 We all need to take a break now and then – we’re only human after all! If you’re noticing signs that something isn’t right, look at ways you can make some changes to give yourself the break you need. ← Gift Ideas For The Young At Heart: Life Begins At 40, Right?